[prMac.com] Del Mar, California - Macphun Software, a leading innovative photography app developer with over 25 million users worldwide, has today announced the launch of Snapselect. A new smart way to quickly pick your best images, Snapselect easily gets rid of unwanted photos and even saves disk space on your Mac. Whether you use iPhoto, Aperture or Lightroom to manage images or simply keep your photos in folders, Snapselect lets you trim your photo library to just the great images you know you want. For more information, visit www.macphun.com/snapselect. Snapselect is an easy-to-use app, which anyone who takes a lot of photographs is going to find useful. A boon for parents capturing magic moments at sports days, birthday parties and family events; ideal for anyone returning from holiday with hundreds of images; invaluable for professional photographers looking to quickly grab the best few images from a shoot or helping to manage their expansive photo libraries, Snapselect enables you to quickly keep or reject a whole range of images in just a few clicks. Paul Muzok, CEO of Macphun said, "For many photographers, taking images is a joy but having to sort through them all afterwards is something they just can't face. We know that many people just leave well enough alone, meaning that so many great photographs of fantastic family occasions or memorable moments are left buried on a hard disk! With Snapselect, the process of separating the wheat from the chaff when it comes to images is made not only easy, but fast." Starting by importing photos from your photos folder, library or external drive, Snapselect will use patented image recognition technology to automatically group similar images and duplicates, as well as sort all photos by the time they were taken for convenient viewing. You can easily browse through images, compare one photo to another, separate bad images from great images, and instantly export the best picks to a custom folder, library and popular photo editing apps, or share via Facebook, Twitter & other social networks. 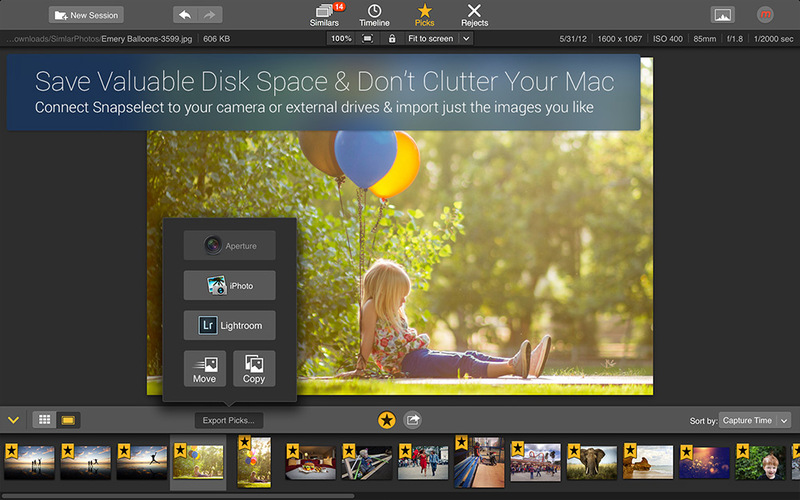 Snapselect 1.0 is available today from the Mac App Store in the Photography category. 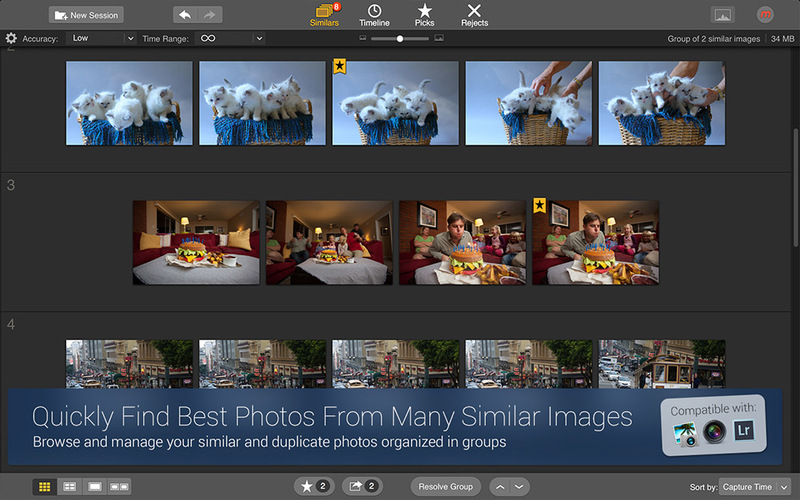 As a limited time special offer exclusively on the Mac App Store, Snapselect is available for just $14.99 USD. Normal retail price is $24.99 USD. The introductory UK price is GBP9.99 while the normal retail price will be GBP 15.99. In Europe, Snapselect will be introduced at Euro11.99 and the normal retail price will be Euro 19.99. Macphun Software is a California based Mac app developer focusing on consumer photography and professional digital imaging markets, serving over 25 million customers worldwide. First established in 2008 with a mission to create innovative photography software, Macphun's products such as ColorStrokes, Snapheal, Focus 2, Intensify, Tonality and Fx Photo Studio are consistently ranked among the top 12 in the paid photography category on the Mac App Stores around the world. All Material and Software (C) Copyright 2014 Macphun Software. All Rights Reserved. Apple, the Apple logo, Macintosh and Mac OS X are registered trademarks of Apple Inc. in the U.S. and/or other countries. Other trademarks and registered trademarks may be the property of their respective owners.